Bob Dylan probably had no idea how much the times really were a’ changin’. These were the boys and girls who freedom-rode to Jackson; who rioted against HUAC; who vigiled for Caryl Chessman, who picketed against the Bomb, who invaded Mississippi last summer; and who turned Berkeley into an academic Selma. They are a new generation of dissenters, nourished not by Marx, Trotsky, Stalin or Schachtman but by Camus, Paul Goodman, Bob Dylan and SNCC — the Student Nonviolent Coordinating Committee. 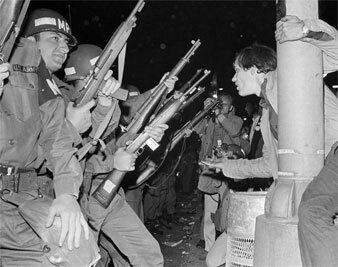 At the climax of the Washington march, arms linked and singing “We Shall Overcome,” were the veterans of the Berkeley Free Speech Movement, freshmen from small Catholic colleges, clean-shaven intellectuals from Ann Arbor and Cambridge, the fatigued shock troops of SNCC, Iowa farmers, impoverished urban Negroes organized by Students for a Democratic Society (SDS), beautiful high school girls without make-up, and adults, many of them faculty members, who journeyed to Washington for a demonstration conceived and organized by students. During the rally they heard the visionary voices of the new radicalism, Staughton Lynd, a young professor at Yale, who explained why he wasn’t paying his income tax this year, Paul Potter, the brilliant president of SDS, who told them they must construct a social movement that will “change our condition”, Bob Parris, the poet-revolutionary of SNCC, who urged “Don’t use the South as a moral lightning rod, use it as a looking glass to see what it tells you about the whole country.” And there were Joan Baez and Judy Collins to sing the poems of Bob Dylan. This is literally a New Left — in style, momentum, tactics and vision. As Potter said in Washington, “The reason there are 20,000 of us here today is that five years ago a social movement was begun by students in the South.” The two other major student groups of the New Left — SDS and the Northern Student Movement (NSM) have no roots in the organizations and dogmas of the 1930s. The student groups affiliated with the old sects — Communist, Trotskyist, and Socialist — remain small and isolated and are seen by the New Left as elitist, doctrinaire, and manipulative. The enthusiasts of SNCC and SDS do not engage in sterile, neurotic debates over Kronstadt or the pinpoints of Marxist doctrine. They are thoroughly indigenous radicals, tough, democratic, independent, creative, activist, unsentimental. Many of the new dissenters are philosophy students, like Bob Parris and Berkeley’s Mario Savio, rather than economics and political science students. Their deepest concerns seem to be human freedom and expression. Their favorite song is “Do When the Spirit Say Do,” and their favorite slogan is, “One Man, One Vote.” One phrase that they use a great deal is “participatory democracy,” and they sing a chorus of “Oh Freedom” that says “no more leaders over me.” At a SNCC-SDS organizers institute on the eve of the Washington march, the young revolutionaries wrote poetry on the walls. During the 1950s, the only symptom of campus disquiet was the Beat orthodoxy of pot and passivity. The Beats sensed that something was wrong with the America of brinkmanship, payola and green stamps but lacked the energy and seriousness to do anything about it. So they withdrew into their own antisocial, nonverbal subculture to read the “spontaneous bop prosody” of Jack Kerouac. The magazines — middle-brow and slick — of the late 1950s were glutted with sociological hand-wringing about campus catatonia and excessive student concern with home, job and marriage. The label “The Silent Generation” was pinned and it stuck. Most of the new radicals date the birth of their movement from the first student lunch-counter sit-in at Greensboro, N.C., on February 1, 1960. In the days that followed, this pacifist tactic of nonviolent direct action, which was to become the hallmark of their rebellion, spread spontaneously throughout the middle South — to Nashville, to Raleigh, to Atlanta. During the 1960 Easter vacation, 300 young Negroes, plus a few whites, assembled on the campus of Shaw University at Raleigh to found the Student Nonviolent Coordinating Committee. What began as an ethical revolt against the immorality of segregation, war and the death penalty, grew slowly during the next few years and began to take on political and economic flesh. Spurred by Michael Harrington’s The Other America, the student movement began to leave the campus to confront the economic roots of racism and poverty. Some went to Hazard, K.Y., to work with striking coal miners, others abandoned graduate school and promising careers to join SNCC or work with SDS and the NSM in organizing the black ghettos of the North. We are taught that it takes qualifications like college education, or “proper English” or “proper dress” to lead people. These leaders can go before the press and project a “good image” to the nation and to the world. But after a while the leaders can only talk to the press and not with the people. They can only talk about problems as they see them — not as the people see them. And they can’t see the problems any more because they are always in news conferences, “high level” meetings or negotiations. So leaders speak on issues many times which do not relate to the needs of the people. Man, the Communists, they’re empty man, empty. They’ve got the same stale ideas, the same bureaucracy. …When he gets mixed up with us, a Commie dies and a person develops. They’re not subverting us, were subverting them. In 1962, when it was reconstituted after a long period of inactivity, SDS was dominated by graduate students, meetings were conducted in sociological jargon, and the membership included many ADA-oriented liberals. Today, SDS has about sixty formal chapters and fifty staff members and has evolved a way-out foreign policy that opposes the West in Vietnam, the Congo and much of Latin America. Since these positions have not been accompanied by equal criticism of the Eastern-bloc nations, SDS has come into increasing conflict with its parent organization, the League for Industrial Democracy, which is dominated by social democrats and dependent on trade-union financing. SDS has also shifted its emphasis from campus recruiting to ghetto organizing, and, in general, comes, under SNCC egalitarian and proletarian mystique. The group, however, has not lost its original intellectuality. President Paul Potter divides his time between graduate school and the ghetto project in Cleveland. Past President Tom Hayden, who did graduate work at the University of Michigan, is now an organizer in Newark. And one of the SDS organizers in Chicago is Richard Rothstein, a 21-year-old Harvard graduate and a former Fulbright scholar at the London School of Economics. One of the major problems now confronting SDS is the role of those students who revivified it in 1962 and who are now 24 to 26 years old. While they are eager for the newer recruits, to become leaders, they themselves have no adult organization into which they can graduate. Lately, the SDS internal bulletin has been filled with soul-searching essays on whether one can be a radical within his chosen profession, or whether a true radical must devote his whole life to revolutionary organizing. The long-range impact of the New Left may ultimately hang on whether or not the new crusaders can fashion in the next few years a new radical, national organization into which students can be funneled. Determined to write their own philosophy and their own history, the new insurgents have become isolated from all previous generations of American dissenters.Already many of the 1930s revisionist liberals, once burned by Stalinism, have issued polemics of scorn and skepticism against the New Left. John Roche, former chairman of Americans for Democratic Action, accused the student zealots as early as 1962 of “naivete about the intentions of the Soviet Union,” and of “escapism and otherworldliness.” Other Polonius-styled essays have followed from Daniel Bell, Max Lerner, Lewis Coser,Nathan Glazer, Irving Howe — and, of course, Sidney Hook, who recently issued a stern rebuke to the Berkeley insurrectionists. Many of the same writers and critics who recently eulogized the dead wobblies excoriate the much less violent SNCC workers.